Digital rights group Fight for the Future unveiled today the next steps in the battle for the future of the Internet: turning the focus on Congress – who have oversight over the FCC and whose actions will determine whether Ajit Pai’s unpopular plan moves forward – with a wave of crowdfunded billboards and a “congressional scorecard” on BattleForTheNet.com showing where lawmakers stand. The group has already raised more than $50,000 toward the billboards, which will go up in the coming weeks targeting lawmakers who support FCC Chairman Ajit Pai’s plan to gut net neutrality rules that prevent companies like Comcast, AT&T, and Verizon from charging extra fees, slowing down websites, and engaging in censorship. The congressional scorecard makes it easy for voters to quickly learn their representative’s positions, and impossible for members of Congress to hide from their constituents. 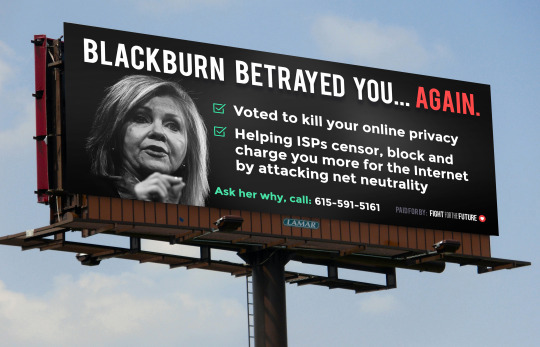 The group plans to initially put up billboards targeting House GOP leadership members who used a meeting last week to threaten tech companies who were participating in the historic net neutrality day of action on July 12 which drove millions of comments, emails and phone calls to decision makers, and saw broad participation from every corner of the Internet from major web platforms, startups, YouTubers, gamers, and forums like 4chan and reddit. The billboards will also mention lawmakers vote to gut Internet privacy rules that prevent ISPs from collecting and selling customer information to advertisers. The congressional scorecard divides Congress into two camps: Team Internet (those who are speaking up to defend net neutrality rules that protect online free speech) and Team Cable (those who are supporting the FCC’s plan to dismantle those protections and give Cable companies control over our online experience.) Lawmakers on “Team Cable” should expect to be targeted with billboards in the coming weeks if they do not speak out against Ajit Pai’s plan. The announcements of both the billboards and scorecard come as all eyes shift to the Senate where Ajit Pai is expected to be confirmed as commissioner this week in a largely procedural vote. Nearly all of the most popular websites on the web participated in a historic Internet-Wide Day of Action to Save Net Neutrality on July 12, 2017 to oppose the FCC’s plan to slash Title II, the legal foundation for net neutrality rules that protect online free speech and innovation. A flood of web platforms small and large like Twitter, Reddit, Netflix, Spotify, 4chan, Airbnb, Amazon, Mozilla, OK Cupid, Vimeo, Tinder, Expedia, Pornhub, Imgur, Yelp, Spotify, and Soundcloud – along with a vast array of online communities from every corner of the Internet: gaming forums, YouTube creators, subreddits and more – displayed prominent protest messages to their users, encouraging them to take action by contacting the FCC and Congress through tools like BattleForTheNet.com that make it easy for Internet users to make their voices heard. Celebrities flocked to support the effort including Pearl Jam, Wilco, Wil Wheaton, Tim Robbins, Susan Sarandon, Blues Traveler, Steven Fry, Mark Ruffalo, Laura Jane Grace, Kendrick Sampson, Amanda Palmer, Ted Leo, Samantha Bee, and many more. Broad participation from every corner of the Internet: from online gaming communities to librarians to real estate sites to grassroots organizations to independent musicians. See a gallery here. Facebook, Google, and Dropbox three of the largest Internet companies, came out publicly with strong statements in support of the current FCC rules. This is significant – especially given Facebook’s previous opposition to certain net neutrality rules, notably in India. The effort is led by many of the grassroots groups behind the largest online protests in history including the SOPA blackout and the Internet Slowdown. Media attention for online mobilizations tends to focus on the big names participating, but there is a much more interesting story: a coalition of Internet activists huddled over their laptops in coworking spaces, home offices, and coffee shops, who are the ones who came up with the idea, called for, and organized the protest, and have since been working together to lay the groundwork, build the technical tools, and create the educational resources that make it possible for large and small websites to participate in these mass days of action. It’s a grassroots effort involving dozens of volunteers working together in Slack channels, outreach spreadsheets, endless email chains, organizing in online communities and forums, and an enormous amount of creativity and digital elbow grease. The list of sites and apps participating has grown so quickly it’s almost impossible to keep up, but participants include Automattic (Wordpress), eBay, Rosetta Stone, Pinterest, Amazon, Mozilla, Netflix, Etsy, Kickstarter, Soundcloud, Dropbox, Spotify, Redfin, Facebook, Google, Snapchat, Medium, Y Combinator, GitHub, Pantheon, Opera, Bittorrent Inc., Shapeways, Nextdoor, Stack Overflow, Funny Or Die, Dreamhost, and CREDO Mobile, Goldenfrog, Fark, Chess.com, Namecheap, DuckDuckGo, Checkout.com, Sonic, Ting, ProtonMail, O’Reilly Media, SlashDot, Dribble, Dischord, SourceForge, and Union Square Ventures. Organizations participating include Fight for the Future, Free Press Action Fund, Demand Progress, Center for Media Justice, EFF, Internet Association, Internet Archive, World Wide Web Foundation, Creative Commons, National Hispanic Media Coalition, Greenpeace, Common Cause, ACLU, Rock the Vote, American Library Association, Daily Kos, OpenMedia, The Nation, PCCC, MoveOn, OFA, Public Knowledge, OTI, Color of Change, MoveOn, Free Software Foundation, Internet Creators Guild, the Women’s March, and many others.